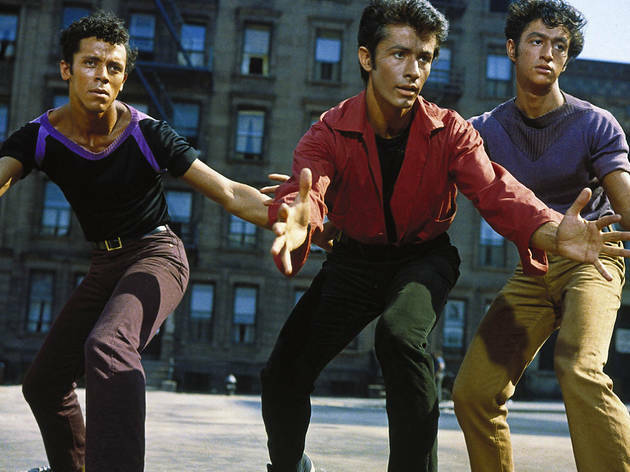 This beautifully restored fiftieth anniversary version of ‘West Side Story’ is being re-released ahead of the BFI’s major survey of the Hollywood musical this autumn. Re-heating ‘Romeo and Juliet’ in the distressed, red-brick pressure cooker of late-’50s New York City, cine-chameleon Robert Wise and choreographer Jerome Robbins made a fine fist of transplanting the Leonard Bernstein/Stephen Sondheim Broadway behemoth to the screen. Set in a world populated by finger-clicking, stoop-dwelling greasers, a senseless turf war between rival gangs, the Sharks and the Jets, complicates a star-crossed romance between Maria (Natalie Wood) and Tony (Richard Beymer). The sins of the father take a back seat to race and gender tensions, as this version examines the notion of dangerously overzealous family pride via the internal dynamics of roving street gangs. A mercurial opening salvo delivers ominous aerial shots of the NYC skyline that are worthy of Antonioni. The camera then dips down on to a basketball court and introduces a beef between Russ Tamblyn’s charismatic Riff and George Chakiris’s highfalutin Bernardo (replete with dodgy Shinola suntan). West side story is definitely a must see. It's probably one of my favorite movies. I agree with the people saying that it is a very old movie and sometimes a bit cheesy (it is a musical!) but the core story unfortunately doesn't age and echoes with our generation and our everyday life. The musics are splendid and the actors are highly talented, both for singing and dancing. If you ever have a chance to watch this movie on a big screen, do not let this go! It is worth seeing in a cinema and having the music playing out loud. Personally, my favorite character is Chita Rivera playing Anita. She is a strong character in this movie and her dancing is just brilliant. 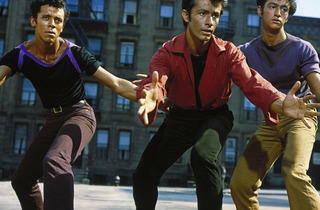 West Side Story, for me, is the classic that never grows old! I never get tired of seeing this great film, whether it be on TV, or on the great big, wide movie theatre screen, in a darkened movie theatre with tons of other people, whether I know them or not. The MGM adage "Unlike other Classics, West Side Story grows younger" is so true! West Side Story: The Classic that Never Grows Old.